Though the primary purpose of using fresh, aromatic herbs while cooking is to enhance flavor, the antioxidants present in these might just be helpful for something far more important. These antioxidants can actually help you fight cancer. Below are the top 5 cancer-fighting herbs that can be introduced into everyday cooking. Oregano is immensely popular in Italian and Mediterranean cuisine. It is rich in the antioxidant rosmarinic acid, and is known to effectively prevent cancer. In an Indian study done on rodents with colon cancer, it was observed that oregano oil supplements modulated the course of cancer development in these mice. Commonly used in Mediterranean cuisine, thyme not only contains good amounts of rosmarinic acid, but also polyphenols like thymol and carvacrol. According to studies these antioxidants significantly reduced oxidative damage of DNA and help prevent cancer. Known for its great flavor, this herb is widely used in American cuisine. It is rich in the antioxidants- beta-carotene, rutin, and quercitin. Also, cilantro helps to remove heavy metals like lead from the body and is in fact used in chelation therapy to treat patients suffering from lead poisoning. This potent root is rich in several phenolic compounds, the two important ones being 6-gingerol and 6-paradol. It is best known for its ability to relieve nausea and has many antioxidant and anti-inflammatory properties. In a recent study, it was found that 6-gingerol was particularly effective in treating gastric cancer. Garlic is well known for the various beneficial effects it has on the heart. However, researchers are now looking into its anti-cancer properties as well. 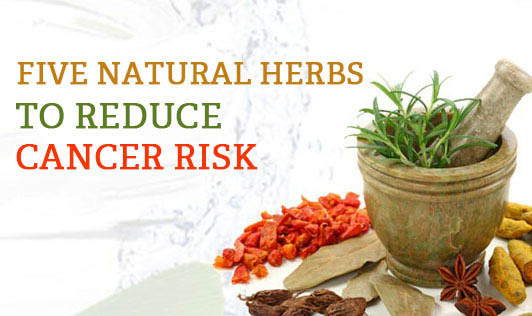 While one study done on sulphydryl compounds, showed the herb to be effective in blocking cancerous tumor formation, several others showed that it decreases the incidence of certain cancers, such as that of the stomach, colon, pancreas, esophagus, and breasts. Thus the modern fad of cooking with herbs is in fact good. Not only does do they improve the dish, they also help prevent various types of cancer.